So vielschichtig Ihre Anforderungen an den Kocher sind, mit dem Sie sich unterwegs Ihre warme Mahlzeit zubereiten möchten, so breit ist unser Angebot an Kochgeräten für Sie. Und wie sagt man so schön: Auf jeden Topf passt ein Deckel - zum Glück haben wir auch noch den passenden Topf für jeden Kocher. Wegen uns muss unterwegs die Küche nie mehr kalt bleiben! Cut your boil time in half with Xcelerate™ Technology. 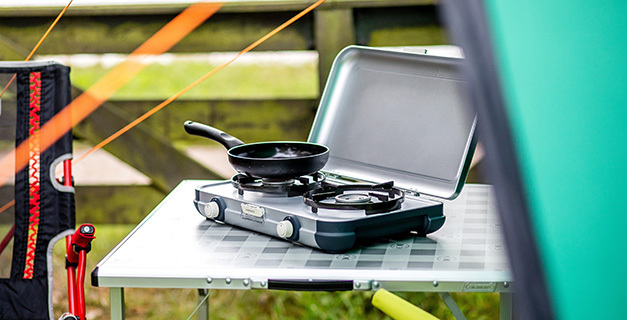 The combination of the Xcelerate™ burner and wind blocking pan supports provide the ultimate wind resistance for your gas stove flame, reducing gas consumption and the time you spend cooking, giving you more time for recreation in the outdoors. Xcelerate™ Burner - The patented burner technology features a lower, more wind resistant, higher performance flame that produces results unmatched by regular burners. WindBlock Pan Support - The patented pan support technology creates a barrier around the burner that provides superior wind deflection. Gas is powerful and fuels the flame on a stove to produce heat. However, without a flame, gas can be dangerous. Left flowing unnoticed in an enclosed space, gas can cause asphyxiation. The Stopgaz™ System is a built-in flame safety device that stops gas from flowing when there is no flame. *How does it work? When igniting a flame on a stove by pushing a Piezo ignition button, a valve in the device is opened letting the gas flow. The heat of flame generates an electric current, holding the valve in an open position. If a gust of wind or other force extinguishes the flame, the mechanism inside the device cools down and the electric current no longer flows, closing the valve and stopping the gas. Easy Clic® Plus, an even more convenient system made for valve cartridges – simply rotate 45° to get connected! 1 - Fix: Applying a small amount of pressure on the device with the cartridge is enough. 2 - Turn: Apply a 45° left turn on the device and you’re connected! Valve cartridges featuring also a self-sealing valve, they can be disconnected and reconnected even when not empty!